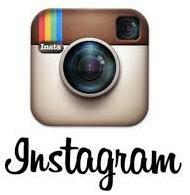 Feedback: 24 comments - leave yours! There are 176 Italian restaurants in Geneva (Switzerland) but only one where the owner can afford to be rude to clients and still keep his place full. La Trattoria, a blue-collar South-Italian restaurant behind the train station. What's his secret? Not the crammed space, narrow tables and ugly service. Not the high prices. Not even the owner's ultraconservative political opinions or his mood swings. None of this would account for the place being permanently full for 15 years. The secret are is Penne alla siciliana, a dish so successful that although it's not even on the menu it's been the restaurant's best seller for 20-odd years and the reason people come again and again. And they take only cash. A veritable money machine, I've been trying to reverse-engineer it for 10 years now and finally succeeded earlier this week. Follow my instructions and make this cult sicilian dish for your friends. Despite the its success, one quickly understands that the eggplants in the pasta at La Trattoria are soaked in oil and hard to digest. While restaurants face economic constraints that make them fry egglpants in an enormous quantity of oil of relatively dubious quality, home chefs can do better. Eggplants, you see, will just soak up as much oil as you throw on them. The result is an oily sponge that will require a 2 hour siesta to digest. 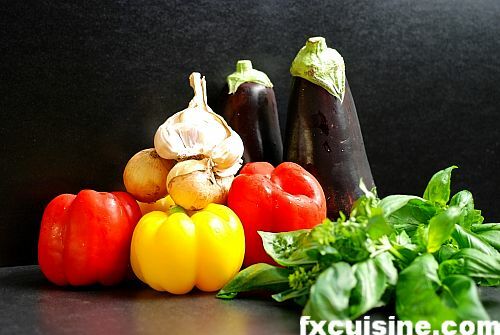 A knowledgeable home cook will use little oil and constantly turn the cubed eggplants until they are soft and brown. 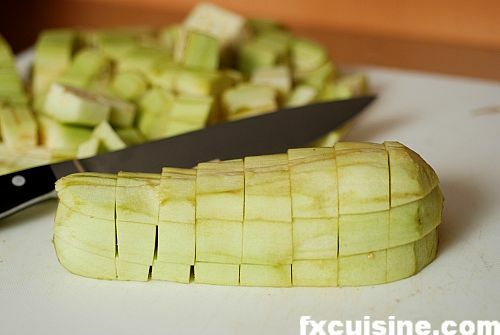 Peel and chop eggplants in 1.25cm/0.5'' cubes. Heat 4 tbsp olive oil in the largest frying pan you have and fry 4 crushed garlic cloves in the oil until light brown. 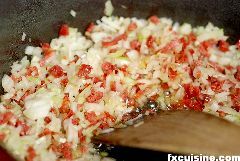 Remove the garlic and reserve for later. 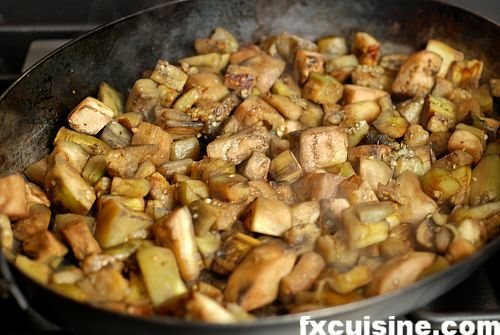 Increase to medium-high and add the eggplant in the garlic-flavored oil, tossing them briskly with a paddle so that the oil is evenly spread across all eggplant cubes. Cook until eggplant is soft - about 30 minutes. Turn every 2-3 minutes to avoid burning. The eggplants will lose about half their volume. Making a tomato sauce is a rather personal business. Fresh or canned? Meat or no meat? It all depends on the cook. Here is the way I do it with consistent excellent results. Feel free to adapt the recipe to suit your taste. 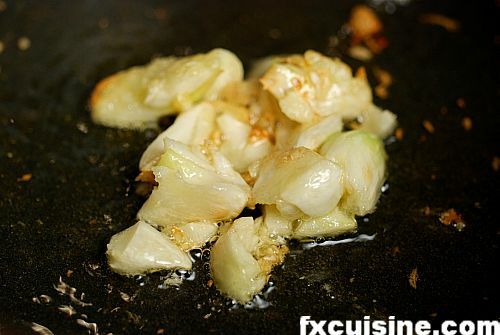 Fry 2-4 crushed garlic cloves in 2 tbsp olive oil until garlic is light brown. Remove the garlic and reserve. Don't let it become brown and bitter. 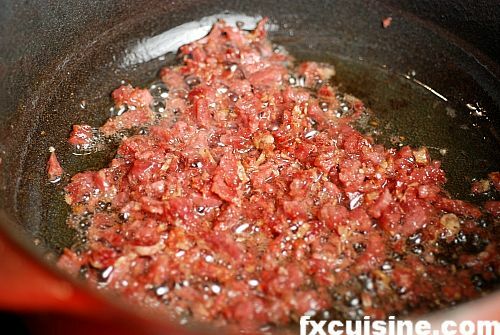 Chop very finely 100gr Italian sausage or pancetta or guanciale or salami and add to the oil. Fry over medium-high heat until the meat turns pale. 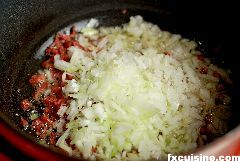 Add 2 finely chopped onions and fry until most of the water contained in the onions has evaporated and they are soft. 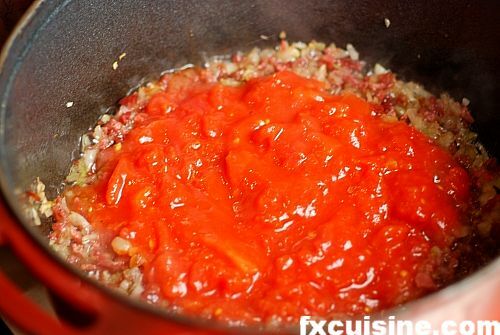 Add your crushed or canned tomatoes and a glass of water. Mix well and bring to a boil. 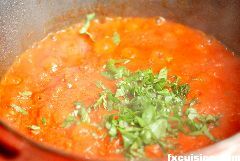 You can also add tomato concentrate at this stage. 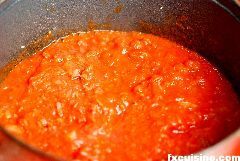 Let the tomato sauce simmer for 15 minutes up to 1 hour. You can add some very finely chiselled fresh basil and let it boil with the sauce, then add some later for decor. 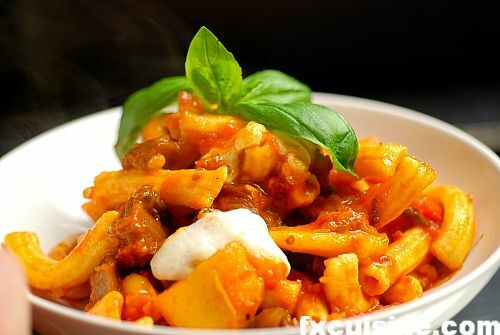 The penne siciliana at La Trattoria don't use any peppers, but traditional Sicilian recipes for this dish do. 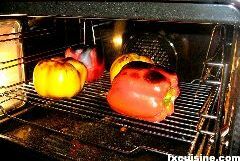 Roast the peppers in a hot oven until the skin blisters and black patches appear - about 30 minutes. 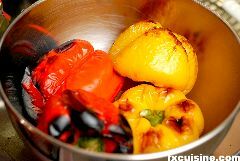 You can also lay the peppers directly over hot embers if you have a fire going. 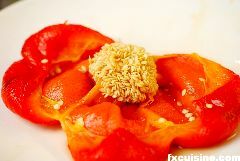 Remove the peppers from oven and put them in a large bowl and cover with a plate. You can also use a plastic bag. this will make the skin blister even more with the condensation and make it much easier to remove. 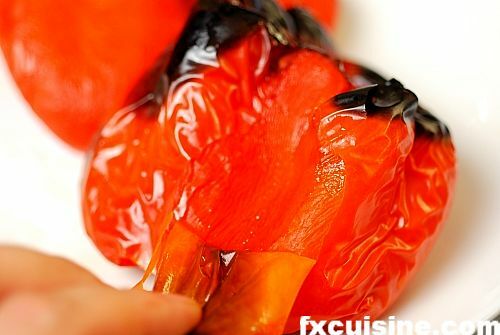 Peel the peppers with your fingers, making sure not to burn yourself. 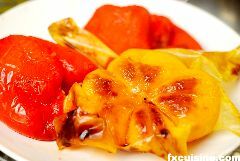 You can rinse them under cold water but quickly otherwise much flavor would be lost.